Thursday, 14th December 2017: Tusla – Child and Family Agency today publishes the Annual Report 2016 of its Early Years Inspectorate. The report outlines the activities of the Inspectorate which is tasked with inspecting pre-schools, play groups, nurseries, crèches, day-care and similar services which cater for children aged up to six years. 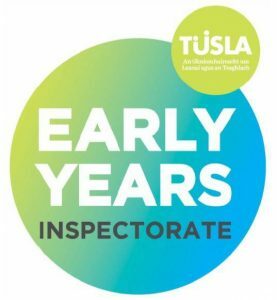 Speaking about the launch of the Annual Report, Brian Lee, Director of Quality Assurance, Tusla said: “I’m delighted to see that Tusla’s early years Inspectorate carried out over 2,008 inspections in 2016, which resulted in positive changes and improvements in key areas such as the health, welfare and development of children, safety of services, governance and facilities. Throughout 2016, the Early Years Inspectorate worked with early years providers to provide information and guidance in relation to the new requirements under the regulations. Tusla proactively organised 14 briefing sessions on the regulatory changes, which were delivered nationwide to over 3,800 early years providers. The Early Years Inspectorate is the independent statutory regulator of Early Years Services in Ireland and has overall responsibility for regulation in this area. The overall purpose of the service is to promote the quality, safety and appropriate care of children by robust inspection of the sector.